Despite the weakness of the global economy, demand for raw materials is still (slowly) growing. Growing demand in depressed raw commodity and shipping markets turns inevitably into tough competition between traditional suppliers and new mines entering the market. developments in the world economy and trade geographical pattern changes altering common shipping network. To mention just a few cases, the industrial diversification in Arabian Gulf countries is attracting a remarkable amount of raw material such as iron ore, alumina/bauxite, for intermediate processing of final product. It is expected that India will soon an importer of iron ore. Power shortages in developing countries attract coal (Egypt,Vietnam, Malaysia, India,Africa, Pakistan, Indonesia,Thailand, Myanmar, etc.). last but not least, the increase of environmental awareness in the entire supply chain from mine to industry. These are the latest challenges faced by suppliers, ship-owners, end users and ports facilities. The lack of infrastructure and/or port constraints are the most significant challenges to face. The US Geological society ranks Africa among the largest reserves of bauxite, phosphate rock, iron-ore and bauxite exploration and mining. Mozambique may become soon one of the top five coal export countries. The ability to export raw commodities exploiting large shipments will be a key factor for the development of mine projects. An effective and efficient supply chain allows for lower delivery costs, providing suppliers and industry with a competitive edge and enabling countries to benefit from trade growth. Local draught restriction or other port constraints prevent local and foreign companies benefiting from economical transportation costs associated with large vessel size, unless alternative solutions can be implemented to overcome the logistical bottlenecks. With economy of scale as a goal, producers and receivers would either need to increase their investment in shore infrastructure considerably or to propose cost-effective alternatives that offer efficiency and reliability in the commodity supply chain. One of the most discriminating factors to obtain an efficient supply chain solution is the feasibility designing stage. It is at this early project step, that the probability that the project will succeed is assessed. direct shipping: whenever possible, the most efficient way to bridge supplier and end user is direct shipping, when vessels are either loaded or unloaded directly in a port suitable for receiving them. This scenario requires that suitable deep water is available close to both ends of the supply chain, dredging does not represent an obstacle (both environmentally and in terms of cost) and cargo throughput (or mine life) justifies the investment in a relatively large port infrastructure. The use of standard ‘gearless’ or self-unloading vessels depends on the trade-off between shipping and port economics. lighterage/topping off: modern fleet of large vessels may be accommodated at loading or receiving ports but not in their fully laden condition. Therefore, in order to fully exploit freight optimization, vessels are partially loaded/unloaded at the closest deep water anchorage site. full transshipment: large vessels are completely loaded/unloaded either off-shore (i.e. Indonesia and India) or mid-stream (i.e. New Orleans and Rotterdam) by means of ship-to-barge or barge-to-ship transshipment operations. The most efficient and environmentally sustainable solution can be found by considering the right balance between operational and capital costs and evaluating the trade off between the various alternatives. Whenever direct shipping is not economically viable, transshipment solutions can be an efficient alternative. Indonesia is the home of floating terminals according to recent market research by Logmarin: 130 out of about 405 units of different sizes and features recorded worldwide have been counted there. In any case, floating terminals are not simply alternative solutions to onshore terminals: they can operate in combination with mainland facilities, thus improving overall import/export activity. As a matter of fact, Logmarin is currently involved in a project requiring integration between existing port facilities and a brand new floating terminal. With the aim of upgrading the existing terminal at Puerto Santo Tomas de Castilla to cope with the expected increase of bulk material tonnage, Logmarin has devised two newbuilding flat top pontoons, for a total length of about 190 metres and 30 metres width, which are currently at the construction stage in China, under supervision from Logmarin. 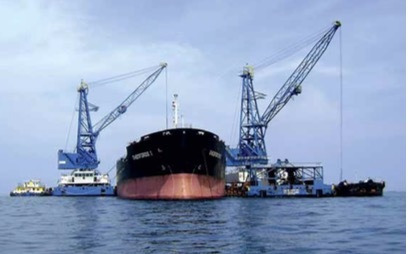 The two pontoons will be towed to Puerto Santo Tomas de Castilla where they will be connected together, and moored in a fixed position, as an extension of the exiting container terminal. The floating berth will be connected to the shore by means of an adjustable connecting ramp for trucks and mobile ro-ro crane. The floating berth will be primary used to handle coal, petcoke, nickel ore and containers. With Asia Bella and Apollo floating terminals being commissioned this summer, the fleet of floating facilities designed and commissioned by Logmarin totals 22 units of different size and features, which have handled more than 70 million tonnes of dry bulk commodities in the last 12 months. Among the recently commissioned transshipment units, while Apollo has been conceived to carry out homogenous coal blending, Asia Bella is a self-propelled floating crane. Also for these Indonesian flag units, Logmarin carried out project management and supervision during construction and testing. the first unit classified by RINA as a ‘transshipper’; v self-propelled;and efficient, burning just a glass of gas oil for each grab of coal handled. sailing with one propulsion system temporarily out of service. Installation, commissioning, training and sea trials at Chengxi shipyard have been successfully performed by Schottel Far East Singapore. Schottel, which is recognized worldwide as a propulsion expert, is a Germany-based company specialized in design, production and marketing of azimuthing propulsion and manoeuvring systems, as well as complete propulsion systems for vessels of all sizes and types. More than ever, commodity supply chain design requires complex and integrated multidisciplinary efforts (technical, financial, geological, operative, maritime, civil, logistics, environmental, fiscal background) to be co-ordinated by a ‘logistics mind’ to seek efficiency, optimization and sustainability. Logmarin has been deeply involved in supporting activities to power plants, mines, terminals, etc — in particular focusing on environmental issues and safety requirements concerning coal supply chain of power station. Among others, Enel,Vale, Egat, Marubeni, Kepco,AES, Banpu, Odebrecht, Golden Bay Cement, etc have already benefited from Logmarin’s expertise and open-minded approach for their greenfield projects. Logmarin has implemented Log.Des, a professional simulation software — developed on Witness Computing Platform — to assess the efficiency of the complete supply chain process. Through ‘Log.Des’ and on behalf of the clients, Logmarin creates a tailor-made real and accurate model of the client’s logistical process in a dynamic-animated computer environment to estimate and foresee the dynamic development of the events, simulated in a low-risk environment, and to identify the optimal solution for any end-to-end commodity supply chain. Log.Des provides a complete view of the logistic system. It allows studying and analysing the interaction between every single component of the system, in order to evaluate the impact of potential changes before their occurrences, to assess performance in different operating conditions and to check analytical results. Log.Des is capable of handling the complexity of a logistic system and includes the randomness and variability that can be seen in real life, therefore it is not guessing, but planning with foresight. The first step is to collect the input data and the information necessary for the model construction. Log.Des takes into account different kinds of input and bottlenecks, specifically applicable for dry bulk supply chains. Information on mine productions, in-land transport, terminal characteristics, physical and environmental constraints, cargo handling equipment details, and storage facilities information is included in the model as well as data on tide variation, navigation restrictions, ocean going vessels type, freights, etc. In this first phase, the logic and operational rules behind the logistic process are translated into the software language to allow the model representing the real process. After the development and the validation of the tailor-made model, Log.Des is ready to represent dynamically the real world process, to evaluate alternative ‘what-if?’ scenarios, to identify the optimal solution and to explore the potential effect of changes on equipment, throughput, costs, sustainability and risks (sensitivity analyses). The output data returned by Log.Des have to be examined by an experienced team in order to estimate the actual efficiency, demurrage risks and annual throughput of the logistics in alternative scenarios and finally identify the optimal solution in terms of cost savings and environmental impact. Comparing the resulting supply chain alternatives, the most efficient scenario in terms of operability, costs and sustainability — based on available information, main assumptions and client’s requests — will be selected. Log.Des helps the end-user’s decision-makers to understand potential opportunities and risks right at a very preliminary stage of the project, assessing possible weakness and bottlenecks beforehand — rather than investing too much time and money in carrying out salvage operations later on after an ‘unexpected fiasco’. In short, to ‘get it right first time’. In the present day scenario, companies that want to be competitive cannot continue to simply offer standard solutions to their clients, but they need to adapt their thinking to requirements of modern day demands and to their clients’ specific needs. The ‘theoretical’ knowledge has to be applied to the realm of practicality and they have to be merged together to put forth an effective design; this is part of the due diligence that a supply chain project requires. The importance of a global approach to the supply chain, the ‘door-to-door’ principle, has been recognized by Logmarin Advisors since the company was launched under the aegis of Rina, the Italian Classification Society, IACS founder. Logmarin works closely with its clients, competing alongside them against bottlenecks in their commodity supply chain as a team to strategize, execute and score the winning goal. That’s why it has long-lasting relationships with its clients and they keep coming back to Logmarin for its services. TTS Group ASA has, through its Business Unit Offshore, entered into three new agreements for delivery of offshore and deck cranes with a total order value of approximately 105 million NOK (Norwegian krone). The main contract is with Triyards Marine Services Pte Ltd. in Singapore for delivery of two active heavy compensated (AHC) subsea cranes for two vessels contracted by an Indian owner. The deliveries will take place in the second and third quarter of 2016. The two other contracts are for shipyards respectively in Argentina and Norway. The Argentinian yard has ordered three deck cranes for a product carrier. Delivery will be in approximately ten months. For the Norwegian shipyard Kleven Verft,TTS will deliver deck cranes for six offshore vessels to be built for Maersk. The delivery time will be 12–16 months. TTS has reinforced its position within the midsize crane segments. “Although the offshore market is in a very vulnerable position, we are actively working on segments showing growth. One is Offshore Support and Supply Vessels (OSV and PSV), where there is a need for AHC technology on medium-sized cranes with 80–150 tonnes’ lifting capacity. The order for Triyards is a result of this,” says Bjo¨rn Anderson, CEO of TTS Group ASA. TTS Group ASA has got off to a flying start for its newly established 50/50 Chinese joint venture company,TTS-SCM Marine and Offshore Machinery Co., Ltd. The company has signed agreements with Shanghai Shipyard Co. Ltd, ensuring delivery of various items of TTS deck equipment for six ships. Total order value is NOK 270 million. The contract includes mainly heavy lift cranes to the ongoing fleet extension program of China Ocean Shipping (Group) Company (COSCO). In addition,TTS will deliver hatch covers and winches to COSCO through another 50/50 joint venture company,TTS Hua Hai. The delivery of the first ship will be in May 2016. “The order represents a further belief in the strategic model TTS has chosen for the important Chinese market,” says Bjo¨rn Anderson, CEO of TTS Group ASA. “Localization of critical business projects in combination with key account ship type packages ensures the successful roll-out plan for TTS growth strategy,” Andersson adds. For several years already TTS has had a successful joint venture experience in China, and is an important player in the Chinese market coming to e.g. hatch covers, winches and some types of cranes. By establishing TTS-SCM Marine and Offshore Machinery Co,TTS Group has taken another step forward with specific regard to the market for heavy lift cranes. The company shall benefit from what TTS already has achieved. Based on well-proven TTS technology and experience, as well as good relations, the new company is well prepared to deliver heavy lift cranes, constituting the majority part of the new contracts. TTS and COSCO are already well known to each other, through several deliveries. “We are proud that such an important customer as China’s COSCO Group has decided to choose TTS again. It clearly shows that our focus on customer satisfaction is the key to success in the long-term strategy,” Anderson says. The TTS deck equipment delivery are for six 28,000dwt Multipurpose Heavy Lift Vessels. COSCO already operates eight identically constructed vessels. Each ship is equipped with the proven TTS NMF type DK II, two with SWL 350t and one with 100t lifting capacity. The order is placed by Shanghai Shipyard Co. Ltd., part of the China State Shipbuilding Corporation (CSSC). “As initial order for the new Joint Venture it is a very important project for TTS, SCM and CSSC,” says Geir Storaas, Chairman of TTS SCM. “The new Joint Venture allows us to combine high end technology with a most competitive position in the heavy lift market,” he adds. Formally the new joint venture company is established by TTS subsidiary,TTS NMF, based in Hamburg, Germany in partnership with CSSC-controlled South China Marine Machinery.TTS NMF has been the leading global provider of heavy lift cranes for decades and in order to maintain this position,TTS now ramps up its heavy lift crane operations in the Middle Kingdom. The company will target a market where the shipbuilding has predominantly moved to China. The company will focus on heavy lift cranes for general cargo and multipurpose vessels as well as on the market for various offshore workboats and supply vessels. In addition to reducing costs and securing market access, the establishment of the new company is also a response to stronger demands from Chinese authorities that equipment for vessels built by Chinese yards ought to be made in China. “In many ways, the Chinese are now creating the same kind of maritime infrastructure as Japan did in the 1970s, and the TTS Group intends to be a part of this development.While other internationals increasingly turn away from partnerships with Chinese players and start their own businesses on Chinese soil from scratch, joint ventures will continue to be TTS’s preferred avenue for getting a stake in the Chinese market for cargo handling solutions. We believe that a joint development on equal footing will be the best for both parties and also find it natural to support CSSC’s strategy of localizing the entire value chain close to their main market,” says Bjo¨rn Andersson. Although the majority of the ship-owners in the general cargo/multipurpose vessel segment are still European, they will face strong competition from Chinese players in the future. China Ocean Shipping Company (COSCO) has expressed a clear ambition to become the world’s largest general cargo/multipurpose vessel fleet operator. TTS-SCM will offer marine cranes from 100 to 800 tonnes, suited for a range of heavy lifts and project cargo, as well as lattice boom cranes up to 1,500 tonnes for various offshore work boats and supply vessels. The company will carry out development, design, manufacturing and assembly of cranes. “By combining TTS NMF’s design and state-of-the-art technology with the utilization of local production facilities, the new joint venture will be able to offer a wide range of TTS-branded heavy lift cranes to CSSC and other important Chinese shipbuilders — with the advantages of competitive pricing and quick delivery. I believe that the new company will be an obvious contender for the heavyweight title in the Chinese crane market,” says Andersson. The new joint venture is located in Guangzhou, the capital and the largest city of the Guangdong province in South China and an important trade and industry hub. The TTS Group ASA is an international group that develops and supplies equipment, cargo handling solutions and associated services for the marine and offshore industries. The TTS Group’s global operations counts a total of 1,100 employees with an emphasis on engineering skills. The group has subsidiaries in Brazil, Finland, Greece, Italy, China, Korea, Norway, Poland, Singapore, Sweden, Germany, USA and Vietnam. LD Ports & Logistics has developed powerful calculation software, BATOS (Barging And Transshipment Optimization Software) able to determine in a few seconds the best loading schedule complying with an extensive list of operational inputs (OGV balance draught survey, hold completion, wheel loader transfer, barge initial and final survey etc.) enabling a very high degree of realism in the modelling. The solving process is a multi-level optimization which combines a linear solving system (simplex) with an enhanced genetic algorithm. This complex solving method enables to find solution to difficult optimization issues, like operating globally a transshipment terminal, from shore facilities to final loading of the ocean going vessel at anchorage. The software tests every possible combination and keeps the most efficient one, thereby minimizing operation costs (despatch and demurrage, fuel consumption) and improving the performance through and intelligent scheduling and control. BATOS creates value to the end used allowing significant savings on freight and demurrage. With optimized barges cycles and floating cranes movements the software has demonstrated that floating terminal loading rate can be increase by +20% compared to a non-optimized case. BATOS also includes a Monte-Carlo application (mathematical method to account for risk in quantitative analysis) to run simulations on the laycan schedule and shipping plan over thousands of scenarios. This application is used to evaluate all the possible ships’ arrival outcomes and their impact on the transshipment terminal. Leading efficient transshipment operations is neither intuitive nor simple, especially on a large scale floating terminal involving several ocean going vessels and many floating cranes at the same time. Being more than a simple simulation software, BATOS has become an unrivalled tool to compare different transshipment solutions and improve significantly operational efficiency. The software allows designing a fit-for-purpose solution to cope with the requirements and specification of each transshipment project (providing export solution to a mining company or supply a coal-fired power plant). “Performance is not only a target it has to be an achievement,” recalls Capt. Emmanuel Du¨r, General Manager of LDPL whose strategy is to design build and operate its own tailored transshipment vessels. The careful selection of equipment and handling process (grab, conveyors, or a combination of both) is critical to ensure a reliable supply, even in remote environments where maintenance of off-shore transshipment vessels can be a challenge. Built with a meticulous selection of highly reliable technology and equipment floating cranes transshipment units (FCTUs) have successfully demonstrated firstly in India, then in West Africa that the concept of a 100% self-sufficient and easy to operate transshipment vessel is achievable. The FCTU is self-propelled by the mean of two azimuthal propulsion systems (no need of assist tug for berthing or coming alongside vessels) and is fitted with its ‘on-board’ maintenance workshop and equipment so as to realize most of the regular works autonomously. Simplicity and efficiency have proven to be two major ingredients to excel in the art of transshipment and ensure continuous performance. The absence of complicated conveyor systems combined with the full ban of hydraulic systems on board dramatically simplify maintenance procedures and reduce breakdown risk, whatever are the constraints of specific minerals. FCTU MIRAMAR (owned by LDPL) has been exceeding expectations by far in terms of performance, demonstrating capabilities to reach up to 1,565 tonnes per hour (37,560TPD) top rate recorded during a full loading of iron ore on a Panamax in Africa last year. Such performance has called into question the legitimacy of using sophisticated transshipment vessels equipped with complex conveyors systems, which can barely reach similar rate handling various quality materials while having proved very limited reliability in remote and difficult environment. Several FCTUs can be combined to load simultaneously a Capesize vessel and achieve loading rate above 75,000 tonnes per day. The use of BATOS software is then a critical advantage to calculate the best loading sequence and optimize the synchronization of all the FCTUs and shuttle vessels employed to supply cargo at the transshipment anchorage. LDPL is the specialized subsidiary focusing on the mining sector and energy industry, proposing a wide range of integrated services in floating terminal and transportations, forging long-term partnerships with leading industrial groups around the world. LDPL has acquired also an extensive experience in development of shallow water solutions in order to ‘feed’ floating terminals.